Associated Press South Bend Mayor Pete Buttigieg announces that he will seek the Democratic presidential nomination during a rally Sunday in South Bend. 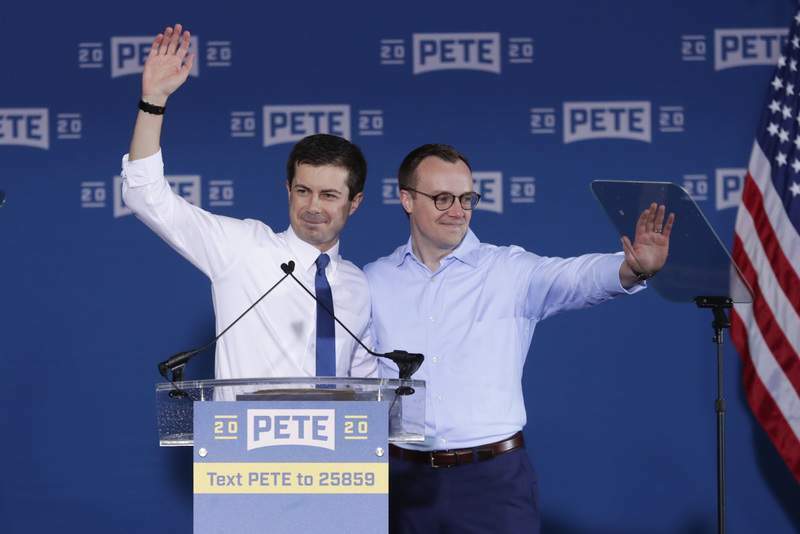 Associated Press Pete Buttigieg is joined by his husband, Chasten Glezman, before he announced that he will seek the Democratic presidential nomination during a rally in South Bend on Sunday. SOUTH BEND – Pete Buttigieg, the 37-year-old mayor of this northern Indiana city who in just weeks has vaulted from being a near-unknown to a breakout star in the Democratic Party, officially started his presidential bid here on Sunday, presenting himself as a transformational figure who is well positioned to beat President Donald Trump, despite being young and facing off against many seasoned rivals. The scene for Buttigieg's rally was a hulking former Studebaker assembly plant, whose closure decades ago rocked this region's economy. The site has since become a data and education hub pushed by his administration – and central to his technocratic, hopeful pitch that he is ready to help communities still struggling with the effects of globalization. “Change is coming, ready or not,” Buttigieg told the crowd. “There is a myth being sold to industrial and rural communities, the myth that we can stop the clock and turn it back,” and he touted his attempts in the city to assist the workforce with training and education programs. Some attendees drove from around the country after being inspired by Buttigieg's message and the historic nature of his campaign as a gay presidential candidate. For Buttigieg, Sunday's upbeat gathering on a dreary, snowy mid-April afternoon was an important political juncture: a reintroduction to a party that has only begun to pay attention to this mayor with an unfamiliar name, but is now certainly listening closely as it searches for a standard-bearer. After a string of buzzy podcast and television appearances, increasingly crowded stops in early voting states and the release of a best-selling memoir, Buttigieg is suddenly a contender in a crowded Democratic field, with a $7 million fundraising haul in the first quarter of the year and a rapid rise in the polls. One of them was Ashley Pawlowski, 34, a self-described independent from South Bend who works at a local nonprofit. Buttigieg's challenge in the coming months: translating this meteoric momentum and goodwill among Democrats who are eager to cheer a confident, youthful voice from the Midwest into a sustained national campaign that can outpace candidates whose careers have made them popular with activists and donors. Buttigieg has worked to rub off the heavy sheen of implausibility from his upstart candidacy, insisting that being a two-term mayor of a city in the middle of the country gives him more governing experience than Trump and that he is the face of a new generation that wants to bypass the partisanship and rancor that has gripped Trump's Washington. “My face is my message,” Buttigieg often tells voters on the campaign trail, a catchall way of referring to a calm persona that has drawn comparisons with President Barack Obama and to his own political profile: a gay Midwestern mayor, a retired Navy officer who served in Afghanistan and a Rhodes scholar who, if elected, would be the youngest president in U.S. history. Buttigieg has generated a swell of enthusiasm among several top Democrats and Obama allies, such as veteran strategist David Axelrod – and Buttigieg has met privately with Obama, who has praised him. Other Democrats remain somewhat muted about the mayor. In recent days, Buttigieg's record in South Bend has come under scrutiny. His administration's efforts to knock down blighted houses in the city have been criticized by some Democrats as a policy that was overly aggressive in revamping lower-income areas that are home to many minority voters. South Bend also continues to grapple with a quarter of the city hovering on the poverty line. Buttigieg's record on race has drawn criticism from Democrats as well, particularly his demotion of South Bend's first black police chief, Darryl Boykins, in 2012. Buttigieg has cited a federal investigation of Boykins as his rationale for the ouster. Boykins went on to sue the city for racial discrimination. 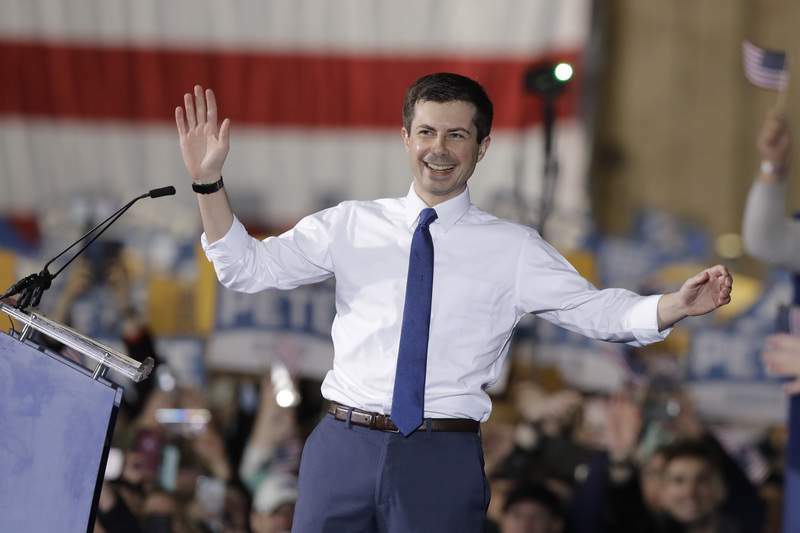 Solomon Anderson, a 57-year-old banker from South Bend, said some in the city's black community remain unsettled by Buttigieg's handling of that incident, even as he and others cheered on the mayor's campaign at the rally on Sunday. And Buttigieg's 2015 comment that “all lives matter,” which has been called insensitive by those in the Black Lives Matter movement that seeks to address issues facing black Americans with law enforcement, prompted him to reassure a civil rights group this month that he understands their concerns and stands in solidarity with their cause. Buttigieg's campaign is aware of the growing spotlight on his mayoral decisions and determined to showcase his record and make the case that running a city like South Bend enables him to understand vexing national issues from a ground-level perspective. Sunday's rally featured introductory speeches from mayors from other states who have become allies, following Buttigieg's work in mayoral groups and his unsuccessful run for Democratic National Committee chairman in 2016.